You’ve at long last chosen to construct that pool that you’ve constantly dreamt of. You might believe that you’re capable of performing most of the tasks yourself but when there’s electrical work involved, it’s far more beneficial in terms of safety and convenience to contract the work to a licensed pool electrician such as the ones from Fitzgerald Electrical Services. With a swimming pool electrician, you can count on seasoned professionals with expertise in this particular field. Electrical work is dangerous especially when you have only a basic understanding of electrical wiring. Now, imagine this danger when working with applications near bodies of water such as a pool, spa or hot tub. More importantly, regardless of whether you are equipped for taking care of the installation yourself, the pool could fail inspection unless you are a licensed electrician certified by your state. In addition to pool electrical wiring installation, it is also imperative that owners give their pools the occasional electrical check. After heavy usage, it may be time to consider a well-earned inspection as your pool does work incredibly hard to keep you cool, so it’s vital that pool owners contact a pool electrician to make sure that everything is in working order. 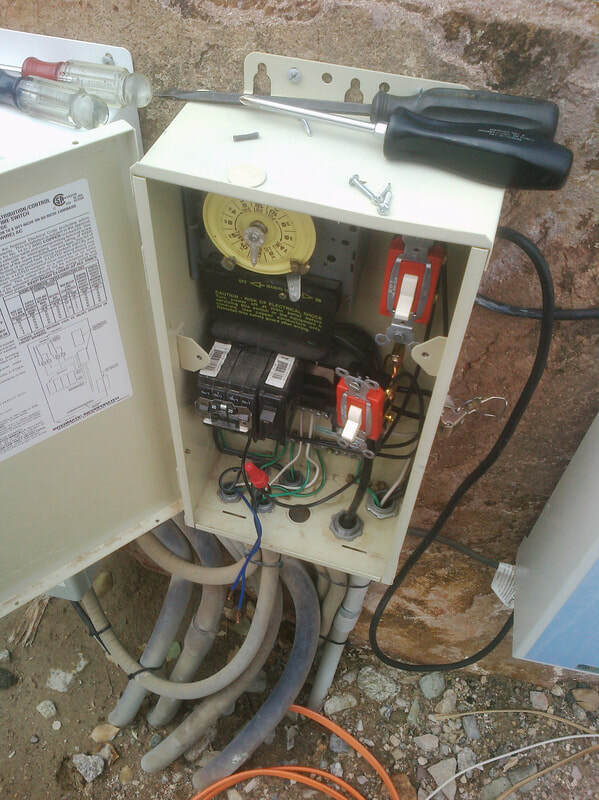 Make sure that you hire a qualified electrician from Fitzgerald Electrical Services to check on all of your pool electrics such as the pool pump wiring and lights. ​Please note that if you ever experience a small electric shock in a swimming pool or even if it Is simply a slight tingle, it’s time to contact an electrician immediately. Electrocution is the second leading cause of pool-related deaths behind drowning. The point in which water mixes with the electricity utilized to power a defective pool pump or damaged pool lights can generate an extremely volatile environment full of charged energy. The kind of water contained in swimming pools contain ions that allow it to be highly conductive. In order to prevent these dangerous electrical shocks from occurring, every visible metallic pool part is reinforced together to create a bonding grid. One of our electrician’s main objective is to evaluate your swimming pool and make sure that is completely safe for its users. Due to the amount of power that pools use to function properly, it can consequently become very hot and at times, overheat. This can become a serious problem for your pool pump as the various moving parts within a pool pump can increase friction, which coupled with electrical failures, can result in extreme overheating. If the pool pump reaches high temperatures as a result of overheating, electrical fire may erupt. It is also very possible that your pool pump motor has been overheating for quite some time without you noticing. If your pool pump feels hot to the touch, it’s most likely time to call a swimming pool electrician. If you’ve ever noticed dim lights in your swimming pool or lights that have gone out entirely then perhaps it’s time to call a certified electrician to bring it back to life! Pool lights can prove to be difficult to repair or replace due to their nature of being underwater. A light that has gone out usually signals a dead bulb but bulbs that burn out before they should or contain a visibly fragmented filament may have been damaged from an electrical surge or bad wiring. Pool lights are also capable of turning the circuit breaker on and off which can become a safety hazard as the circuit breaker protects the electrical line connected to your lights. The professionals at Fitzgerald Electrical Services have been offering pool wiring services for 23 years and take immense pride in the pool wiring that they produce for their valued customers. Through acquiring a C53 Swimming Pool Builders License in 2003, we have been authorized as specialized pool electrical contractors. We provide pool wiring services in Carlsbad, CA and surrounding areas in San Diego as well as Edmond, OK and the surrounding areas in Oklahoma City. Contact us today for your electrical pool wiring needs!